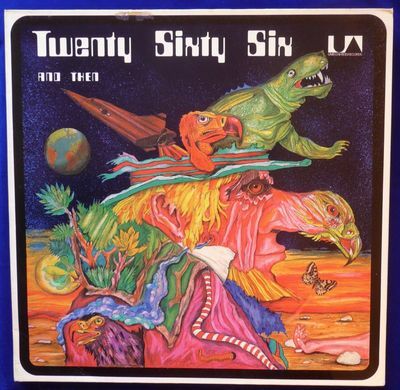 Twenty Sixty Six and Then "Reflections on the Future" United Artists UAS 29 3141 Original German Stereo Gatefold LP. Cover: VG++: One corner is slightly creased and a couple of corners are very slightly dinged. There is some sticker residue on the front cover. Record: E+: There are a couple of very, very light, superficial, inaudible paper scuffs. As a general overview, all the albums listed are from the collection of the estate of a record industry executive who worked for or with United Artists in the '70s among other places. A majority of the collection are records on United Artists and their subsidiaries (like in the '70s, Blue Note Records). Some are still factory sealed and many are promos. They are for the most part lightly played (the older records, from the late '50s and '60s generally have a little wear), if played at all and have been properly stored. Most do not have scratches of any kind but when held under harsh light and at a proper angle, you can see the faintest of superficial paper scuffs here and there which are of course inaudible. This is a general description, the grading above is more specific to the actual record listed. I have not used the excellent grade in the past but I'm doing it here because these are all stronger then VG++ and since I'm a conservative grader, I don't think they are quite NM (because of the paper scuffs described above).